Unique ingredients enhance bulb performance with an increased vase life versus standard flower food formulas. Prevents premature bent neck and stimulates water uptake. 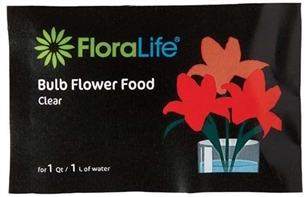 Bulb food solution works to reestablish the nutrient balance once the flower is harvested. Suitable for use in mixed or straight line bouquets containing bulbs and foliage greens.